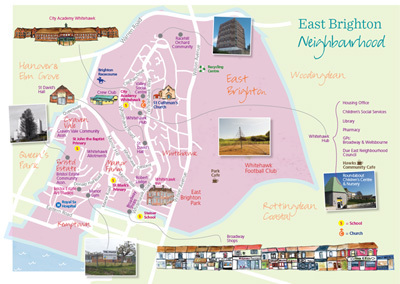 This Neighbourhood Action Plan is a commitment to working collaboratively to improve and develop East Brighton. It is based on a range of information that has come from events, meetings and conversations with the residents from Whitehawk, Manor Farm, Bristol Estate and Craven Vale over the last five years. There is a real desire to participate and residents have great ideas and local knowledge to improve the local area and to set up, run and deliver activities and services through community groups and organisations. This NAP aims to fulfil the commitment within the Brighton & Hove Collaboration Framework working collaboratively to improve and develop East Brighton.